Would you like your teen to be a leader? Before we continue, let us be clear that being a leader and being a “star” are not the same thing. While there is certainly nothing wrong with popularity or achievement, leaders stand out more for their character and actions rather than for their talents or bragging rights. True leaders, in fact, are not motivated by recognition as much as they are by purpose. Being a leader is about making a difference in the world … and paying the price. True leaders possess at least three very important traits: they are responsible, they care and they act. Leaders can be counted on to complete a project or goal; equally, they are prepared to accept any blame. Leadership requires hard work and commitment, but it is also personally rewarding. Miriam is elected president of her class. The student council is responsible for throwing the first dance of the year. Though Miriam does an excellent job of recruiting volunteers, delegating tasks and setting up a work schedule, only a few officers and volunteers actually show up to help the day of the event. Though disappointed, Miriam carries on with the team she has. She works non-stop and even cancels her hair appointment to make sure everything is ready for the dance. Despite the setback, she and her team still managed to throw an impressive dance. Lesson: No matter what it takes, leaders get the job done. Ture leaders are selfless, not selfish. They are willing to help and empower others even if it requires a little bit of sacrifice. Their actions speak louder than words and inspire others. George is the manager of the high school basketball team. Traveling to another city, the team stops at a fast-food restaurant to eat. One of the players forgot his credit card, and George only has enough money for himself. Though he would like to eat, George chooses to give his money to his teammate so he can eat and have energy for the game. The other players notice that George has nothing to eat so they all chip in and buy him a meal. George ate last, but he didn’t go hungry after all. Lesson: Leaders look out for others, not just themselves. Leaders can create positive change in their communities, and they do not have to be in positions of power to do it. They simply need the desire to help and the willingness and determination to carry out the work. Eric noticed that there were many panhandlers in his city. To help the homeless, the teen first asked his church youth group to help him collect dried food and toiletries. The youth packaged the items in plastic bags and gave them to the panhandlers they encountered. The youth group quickly ran out of supplies, so Eric asked his church to donate money or items to the cause. He also wrote a letter to a local grocery and was able to receive more food and toiletries. Though his efforts, Eric’s church started a new outreach program. Lesson: Leaders don’t wait for something to happen. They make it happen. By helping your teen develop as a leader, you are giving him or her a serious lifetime advantage. If your son or daughter can learn to lead early in life, he or she will continue to lead both in the workplace and community. Just remember that teenagers learn both good and bad examples of leadership from the adults they interact with each day, such as teachers, coaches and relatives. If you really want your teen to be a strong and responsible leader, then set the example. 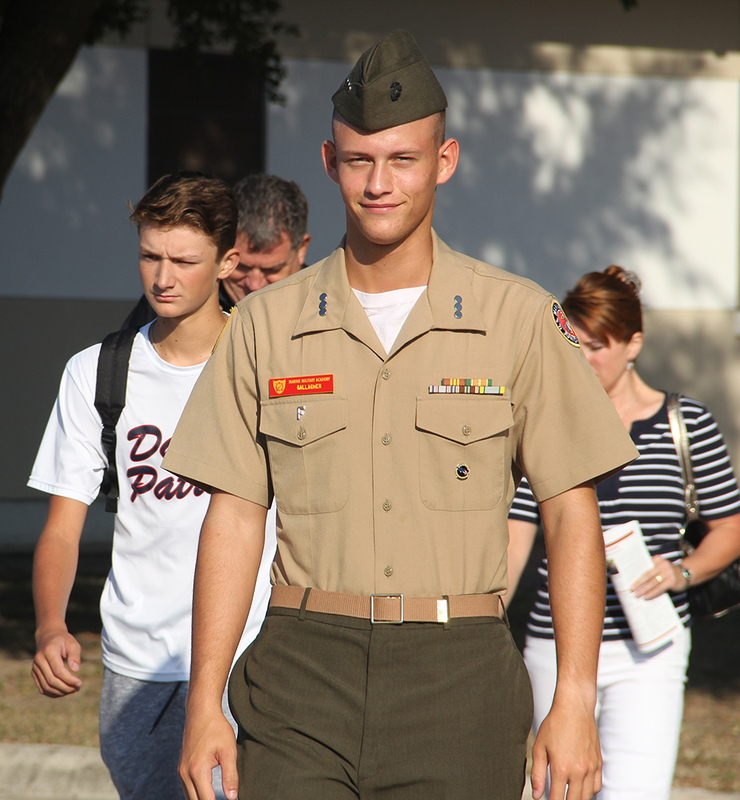 Marine Military Academy is a college-preparatory boarding school for young men in grades 8-12. The outstanding leadership program at MMA draws boys from around the world. For more information on MMA, visit MMA-TX.org.